Boy oh boy, we had ALOT of fun at our annual tattoo convention this year! Saturday the 28th November dawned bright and sunny, soon turning into a sweltering high of 32 degrees and hardly any wind! Preparations started as early as 7am with everyone eager to get set up and ready for the day ahead. Besides having 5 of the top tattoo artists in Cape Town present at the event, there were also 2 top-class piercers, a craft beer bar, accessories by Retrospective, a cool Monster Energy Drink tent, Day of the Dead mirrors and posters by Alan Munro, delicious & gigantic burgers by the NOB, vintage cars organised by Vintage Custom Auto Works AND rocking live performances throughout the day by The Ratrod Cats (a well-known local rockabilly band)! The kickass guys from Zang Chocolate came and spoiled all who attended with free chocolates and Jack Daniels treated everyone with free shots and prizes! Uber kindly partnered with us to offer all first time users R150 off for their first ride and VT Med Waste disposed safely of all medical waste on the day. As if that wasn't enough, we had our Jumpstart out for anyone that wanted to experience the Harley® feeling without having to own a bike license. We also ran a competition for the best tattoos and chose 5 top winners who received AWESOME prizes including a Jack Daniels hamper, clothing and accessories, cases of craft beer, CD's and lots of sweets! A HUGE thank-you to everyone involved in making this event such a success, as well as every person who joined in on the fun on the day! We look forward to next year's one - DON'T MISS OUT!! 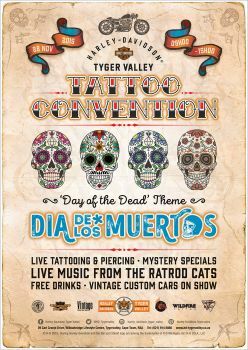 Tattoo artists were: Ryan Wildfire Bell from Wildfire Tattoo Studio Canal Walk, Leigh Soulink from Sleight of Hand Tattoos, Shaun Dean from Emerald Fox Tattoo Studio and Tyrone Swanepoel & Chanel Ysel from Hoodoo Tattoos. Piercers were: Dominique Amanda from Body Modification by Dominique Amanda and Breda Weise from Body Piercing by Breda Weise.